Demonetization in India is pushing every common man in the country to go for Cash Less Transaction. Part of this population is the 40% of the workforce in SME organisations still on Paper bound HR Transactions. 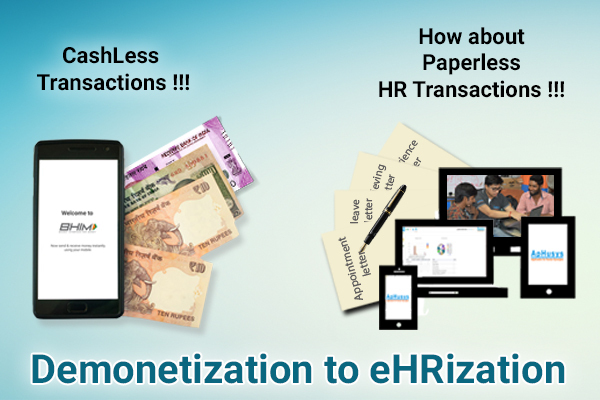 Its High Time for Employees are rewarded with an experience called "e-HR or paperless HR"
Who in HR have expertise in setting up this ? How can it improve the employee experience? There are number of transactions that happens with employee on a daily basis within the organisation. Lets list quickly some of them - We can't dare to put all that in a very short time, but this is an attempt top of mind list !!!! and the list may end up into a 2 GB document how employee efficiency has been compromised with administrative work in HR. Lets stop here and review how much time that this consumes for an individual & also to the Department who are handling. Employees are put to such ordeal by the HR department and consumes at least, A whooping 6.6 Million Hours are spent by SME employees in India with an average of 30 minutes a month managing paperwork along with HR Department. A quick research of 500 companies over 15 years with an average of 100 employee shows the following result of HR Time. <200 busy.="" department="" following="" for="" hr="" interaction.="" is="" keeps="" p="" people="" question="" results="" the="" then="" throw-up="" time="" where="" which="">Surprisingly many services and Technology companies in India the HR Department is far behind in using technology in HR improvement for their employees. That's too much to think and act !!! Cloud is invading the HR Space and going to make the life of HR Manager easy and do what they are supposed to be doing. A quick review of companies who used HR Cloud the drastic change in HR Time spent for better employee engagement. Here is what the outcome. HR Cloud is here to help save Cost & Time. Improving morale of employees and adding a great value to productivity and business value. JUST BE THE TECH THAT YOU NEED TO BE !! We at Husys committed to the total workforce productivity in bringing Technology closer and affordable. We continue to invest our expertise in building knowledge & tools. Please follow this blog for more and more interesting areas where HR Department can add value with Right tools with affordability.